We got seven peaches off our peach tree this year. Oh my, they were so very good! But obviously, with only seven we just ate them and didn’t even think about preserving them. So, I did what I do every year. I purchased peaches so I could actually preserve peaches for the rest of the year. 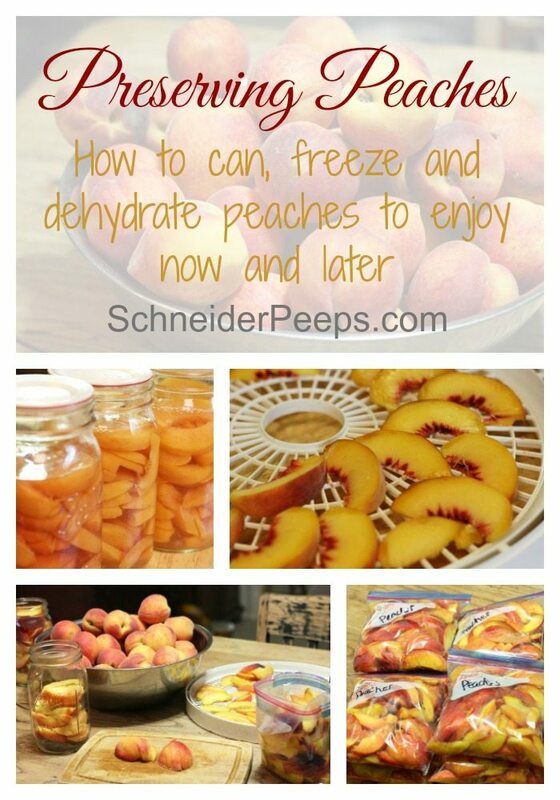 When we preserve peaches we freeze most of them, but we also can and dehydrate some. I wash the peaches and then start cutting them up. If you purchase freestone peaches, this part will be pretty easy. Just cut the peach in a half all the way around and then twist it to release the pit. Then I slice the each half into four or five pieces. I sort through the peaches as we cut them. If the peach is firm it gets canned, if it’s ripe but not bruised it gets dehydrated, any that are bruised or mushy get frozen. Once the dehydrator is full and I have all the jars that I want to can full, all the rest get frozen. If you’re new to preserving food, I highly suggest purchasing a copy of The Ball Blue Book which is pretty much THE standard for preserving food. We don’t can a lot of peaches each year but I do like to have a few jars of canned peaches in the pantry for cobbler. One of the great things about canning peaches is that you don’t need a pressure canner, you will just water bath can them. I try to use the peaches that are not super ripe to can. The firmer they are the less mushy they’ll get while processing. One other thing that I do, or actually don’t do, is I don’t peel my peaches. I know….you’re supposed to, but I don’t and my family doesn’t care. I’m also not going to be entering my canned peaches in any county fair so there’s no need for me to peel the peaches to impress anyone. The first thing I do when I can peaches is make a light simple . In a sauce pan, mix 5 3/4 and 1 1/2 cups of sugar and bring to a boil. Turn down the heat but it still needs to stay hot. I choose to raw pack the peaches but you can hot pack them. The jars need to be hot when you start, you can run them through your dishwasher or put them in a pot of hot water. Once the jars are hot, put the peach slices in them and then pour some of the hot light syrup in the jar leaving a 1/2″ headspace. 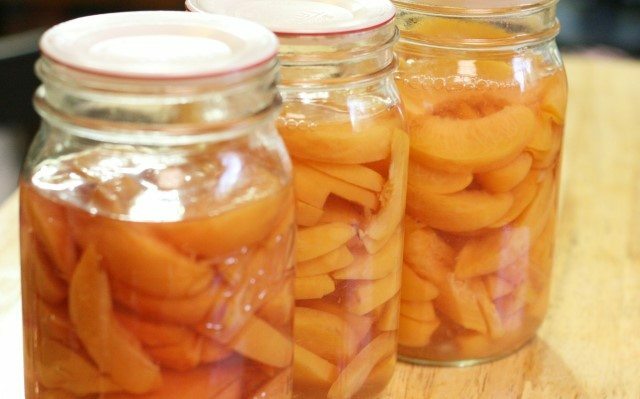 You’ll want to pack the jars pretty tight with peaches so that they don’t float once they’re processed. After the syrup is in the jar use a run a plastic wand around the edges to release any air bubbles. Put the clean lid and band on the jar and process in a water bath canner. If you used quart jars and raw packed them you’ll need to process them for 30 minutes. If you’ve read any of my other preserving the harvest posts, you know that I don’t blanch my produce before freezing it. Yes, I know that’s what you’re “supposed” to do. But I don’t and my family doesn’t care. If that is just too much for you and you are more of a rule follower than I am, then by all means blanch your peaches. You can also peel them if that’s what your family likes. The idea is to get the produce preserved in such a way that it benefits your family. 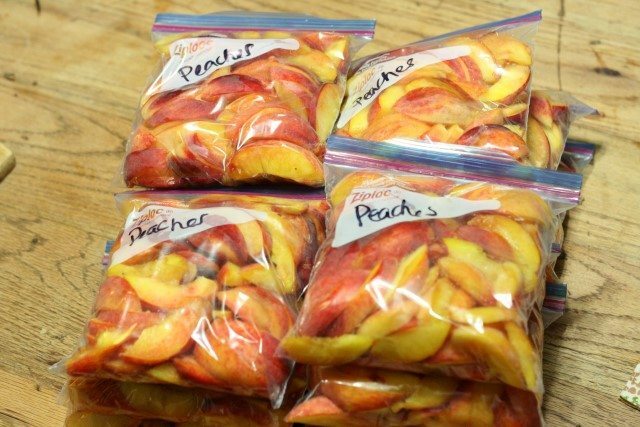 As we’re sorting through the peaches, I put any peach slices that are already mushy or bruised in freezer bags. After I have all the dehydrated peach slices or canned peach slices that we need, I put rest of the peach slices in freezer bags. When they’re full, I zip them up, label them and stack them in the freezer. When we pull them out for fruit crisp, we thaw them some but not completely. For smoothies (which is how we used most of the frozen peaches) we use an ice pick and break off a chunk. 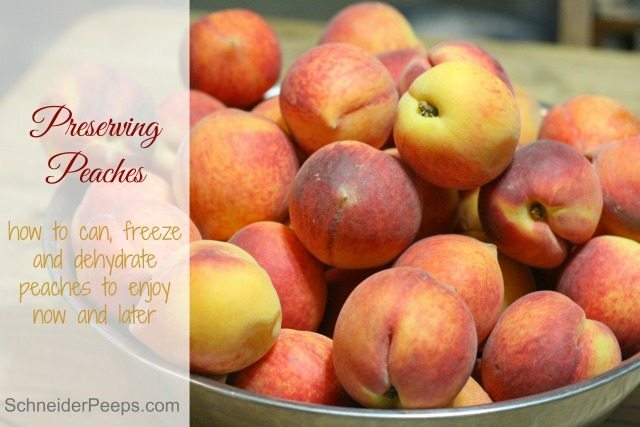 Another way to freeze peaches so that they are easier to use as individual slices is to line a baking sheet with parchment paper and then put the peach slices on that and freeze them. Once they are frozen you can transfer them to zip lock bags. This works great if you don’t have tons of peaches or if you don’t mind not processing them all at one time. 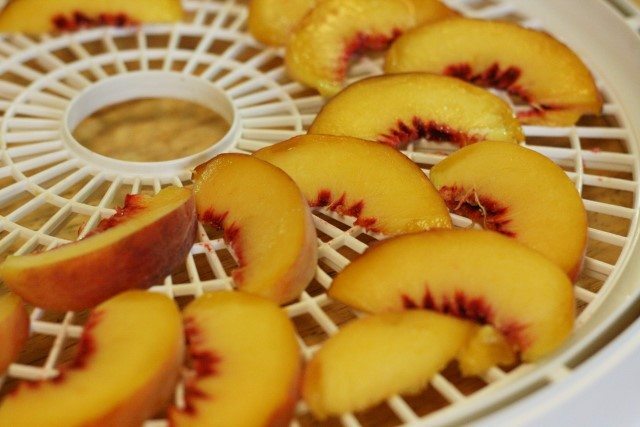 When we’re processing the peaches I make sure that both our dehydrators are empty and ready to go. I fill the trays with slices as I sort through the peaches for canning and freezing. Once the trays are full, plug in the dehydrators and let them run overnight. Some people choose to put their peaches in lemon water or citric acid water to keep them from getting brown while they dehydrate. I’m sure you can guess that I don’t do that. My family is okay with our home dehydrated peaches looking darker than the dehydrated peaches you can buy in the store. If your family won’t be ok with that, you can dip them in lemon water or citric acid water before dehydrating. After reading this and some of my other preserving the harvest posts, I realize that it sounds like I’m kind of lazy or don’t care to have our food look good. Let me assure you that’s not the case. Like everyone else, I have limited time. So, I can either process all the peaches we need for the year in one day or not preserve all the peaches we need for the year. There is just too much preserving that needs to happen in a short period of time for me to worry about things my family doesn’t care about. I hope that one of the things you get from reading the articles on this site is that there are times when “done” is better than “perfect”. I also never want to give the impression that what I do this the one right way of doing things because what works for me and my family may not work for you and your family. You need to do spend your time doing the things that your family cares about, so if they want the peaches peeled, peel the peaches. 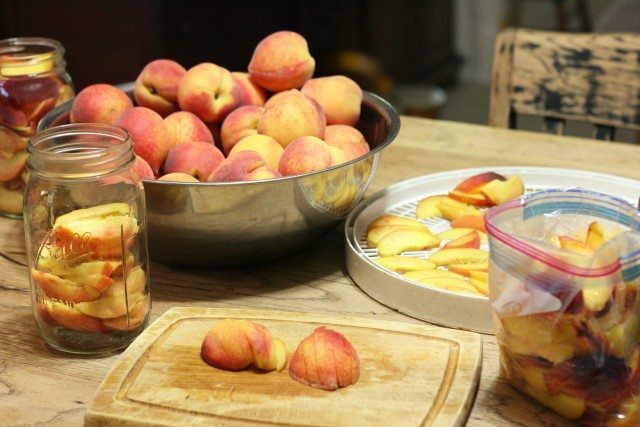 What’s your favorite way to preserve peaches? My kids’ favorite is to blend them smooth and dehydrate on solid trays into fruit leathers. We like to fill the trays up quite full so the end results are thick and chewy. Add a little cinnamon and vanilla! yum! Thanks for sharing Aimee. We made fig and apple fruit leather recently and I wondered about making peach. We’ll have to try that. Love peaches! I have just been too tired this year to preserve anything. I have seasons like that too. There’s always next year. I sprinkle some Fruit Fresh on peaches before I freeze them. Otherwise they look brown when thawing to use. How many hours do you dehydrate the peaches for? It just says overnight but how many hours do you think? Thanks!! There are many variables such as how thickly you slice them, how much water content they have to begin with, how hot your dehydrator gets, etc. but I would say 6-8 would be a good estimate. What temp. For 6-8 hours?